I am stopping my medications. I am sure you noticed the increasing “security” around prescription drugs and the increasing difficulty of obtaining them (don’t I sound like an addict right now…) And, if filling and picking up the prescription is a piece of cake, paying for them is not, even if you meet your insurance deductible. 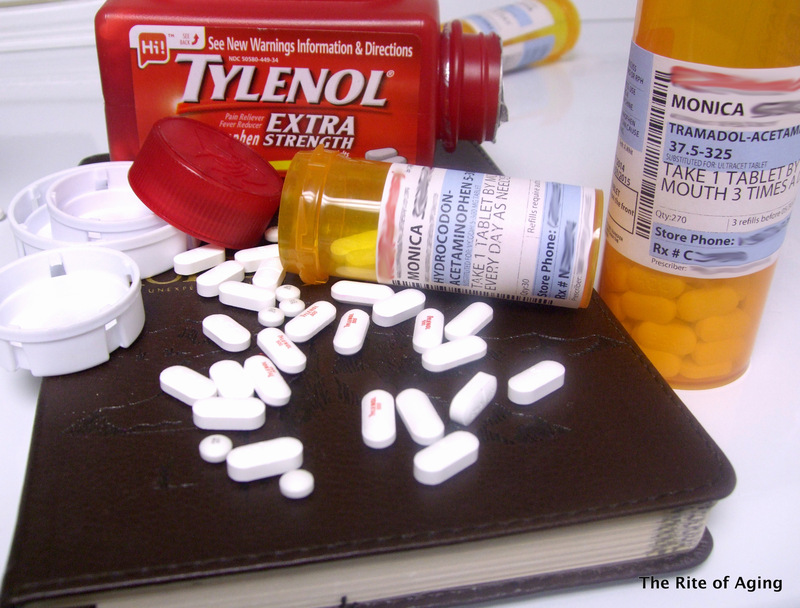 Today’s post is not about my specialty medication but my everyday run of the mill prescriptions. Enjoy! Before we get into the lovely narcotics let’s work start with literally the most boring supplement ever.. I take a weekly Leucovorin Calcium tablet. It is a folic acid supplement that counters the effects of my chemo medication, Methotrexate. It protects my red blood cell counts and reduces my nausea. Honestly, I am not sure what happened but back in December I ran out of pills. I called for a refill and my insurance declined it. Apparently, they would not refill for five weeks! I thought I only took two extra pills when I missed my weekly injections…why wasn’t it covered? This was most certainly not a opiate. It probably had a negative potential for abuse. It’s now time for the fun stuff! Let’s start with Tramadol, the least aggresive of the two narcotics I talk about. On my “foggier”, more flared up days I felt like my brain was deteriorating and decaying from the inside. I sometimes did not even remember conversations while I was having them! I tried to lessen the amount I worried about by placing my prescriptions on “Auto-Fill”. The pharmacy refilled medications as early as seven days and paid me a courtesy call when they were ready for pick-up. Tramadol is now a Class IV substance. It has always been considered a “controlled” substance but with the new classification pharmacies were no longer legally able to fill the prescription before its due date. On top of that, they need a new written prescription every few months. My pain medications are one of the more important pills I take on a daily basis. They take away my pain and allow me to function (How much more do I sound like an addict now?) What if I cannot get to the pharmacy that same day? Am I supposed to go without painkillers? It’s not the biggest deal in the world, just a little extra work. Speaking of extra work…. Now it’s time for the really fun stuff! Vicodin does not make my daily medicine list. It does not even make my monthly or bi-yearly list. It is reserved for those special occasions when I f*ck up my spine so badly the pain radiates throughout my entire body (I rarely curse on the blog but this pain warrants that language). My spine is the few areas that are not as affected as other joints except during very, very bad flares. We got a snowstorm last weekend. An actual snowstorm, with at least five or six inches of accumulation. I got a true snow day which unfortunately, includes shoveling. I only freed the back and driver’s side of my car so I could get out the driveway but I felt it in my lower back. I added insult to injury and gave Saachi a bath. While she was in ICU she refused to pee until she could no longer hold it and urinated in the cage. She was a stinky pup but I had to wait for her suture line to heal over the two week recovery period. It was easy to give her a bath but it was activity I was unused to. As I was getting ready for bed I knew I was going to pay for the extra work the next day. I was already in discomfort but I could feel the acute tingle creeping in. Usually, sleep healed my pain but this time it was not enough. I was fighting a sinus infection and a flare and there was just not enough energy left over. I called my doctor for a Vicodin prescription and asked his medical assistant to fax it into the pharmacy for me. Guess what? The FDA also re-classified Vicodin as a class II drug. This meant faxed-in scripts were no longer accepted. I had to physically pick up and submit the prescription myself. The last thing I wanted to do while my spine was out and could not even bend down was drive to my doctor’s office, drive to my pharmacy and wait for the drug! Eventually, I got my pills, I filled my prescriptions, I did not even pay through my nose for them…it was just getting tougher and tougher to get hold of them. Have you had trouble with any medications? What has changed over the past few months? too frustrating! i totally understand the regs with narcotics, but it’s too hard for people who are in serious pain. when my dad had serious surgery they wouldn’t allow the hospital to call meds in. we had to go in with the script and wait for them to fill it while he was in pain and shouldn’t even have been traveling around – he needed to get right home, but instead we’re dicking around at the pharmacy. Ooh wow…that’s really unfortunate!! I can’t believe they made him wander around after surgery…aren’t you supposed to stay on bed rest and restricted activity? Hospitals are the worst; they’re too freaking out about liability and lawsuits to put patient care first…strange they didn’t fill it at their own pharmacy! I wanted to thank-you for sharing what you go through. You are educating the public on something most just don’t understand. You really are an RA warrior!! My mother was on methotrexate but couldn’t handle it. Her doctor never recommended the “Leucovorin Calcium tablet”. So, thanks for mentioning that! Out of curiosity, has your doctor mentioned any connection/correlation between methotrexate use and ovarian cancer? I tried googling it and what I found was interesting but since I’m not a doctor, I don’t really know what it means. Helena! I hope you’re well! It’s great to hear from you again! I was on Folic acid for a while but it wasn’t strong enough to counter the side effects so that’s when my doctor switched me…your mom should definitely ask hers about it! He hasn’t…but that makes sense. I know MTX can decrease fertility in women. I remember reading an interesting study that women with fewer periods (due to multiple pregnancies) were less likely to develop ovarian or breast cancers!